New York City - Smock. Are you 1…Are you 2…Are you 3…..
Get ready to blow out those birthday candles! Check out these recently printed birthday party invitations submitted to us by our friends at Judy Paulen Designs in New York, NY. 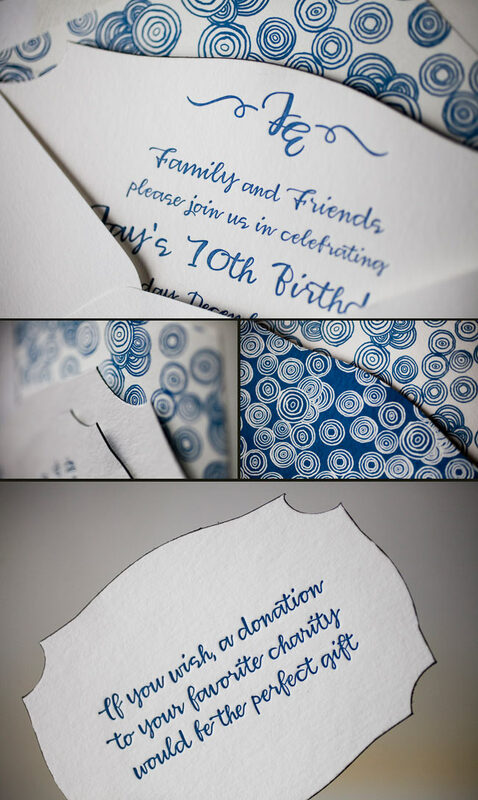 Our plymouth die cut adds even more boyish charm to an already youthful looking birthday party invitation. We can’t get enough of the granby backing patterning in navy, and take a look at the envelope liner in reverse granby in navy-for another super cool customization. Alright now, let’s get the party started! 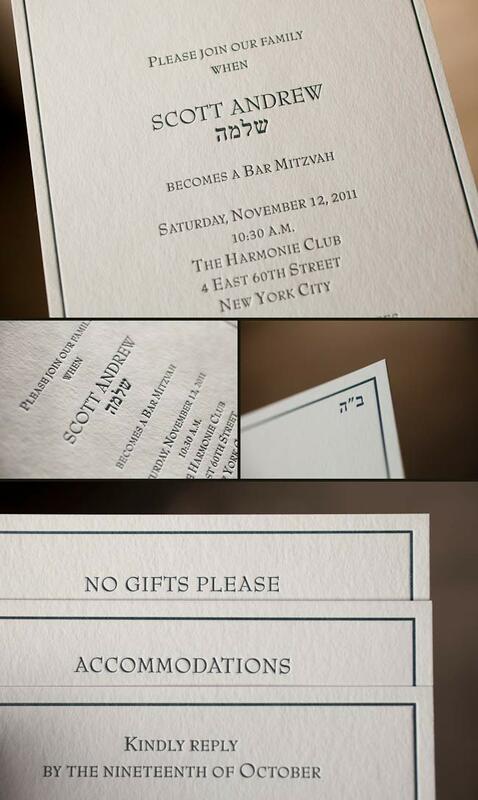 We don’t think you can get more clean cut and classic than these custom letterpressed Bar Mitzvah invitations. 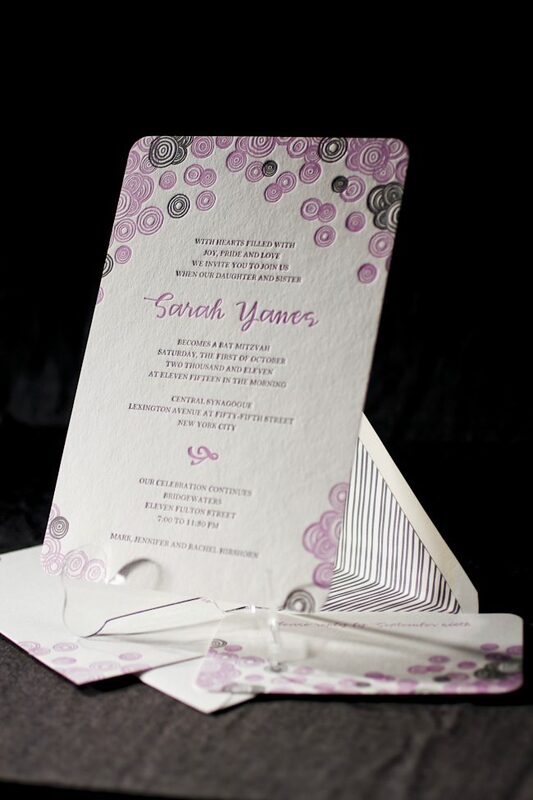 This simple set was submitted by our wonderful friend, Nancy at Reed Cohen Paper & Events in New York, NY. 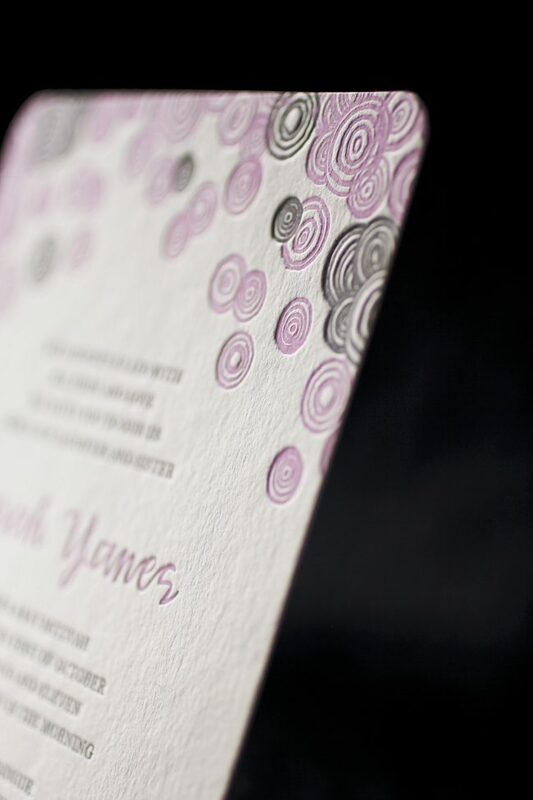 Letterpress printed in our midnight ink with the most modern border as an accent helps keep this set downright classy. Staying in the lines of tradition, the Hebrew characters in the upper right hand corner symbolize the traditional Bais Hey blessing. 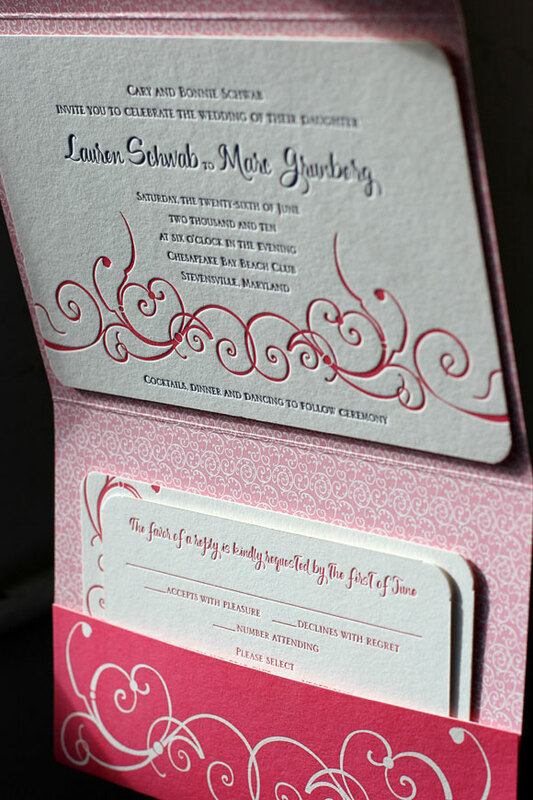 Our 2-ply card stock is always a popular choice for Bar and Bat Mitzvah invitations. 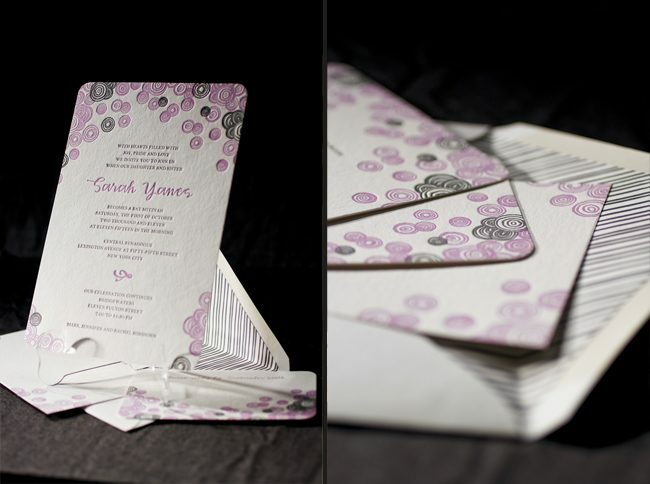 We love how the block font brings a masculine feel to this invitation suite. We were so thrilled when Lily Kesselman (the amazing photographer behind this next real wedding) shared her images of Katie & Jack’s gorgeous New York wedding. Katie worked with our friends at Judy Paulen Designs for their elegant Haddington wedding invitations, which were printed in midnight ink on our white bamboo paper. 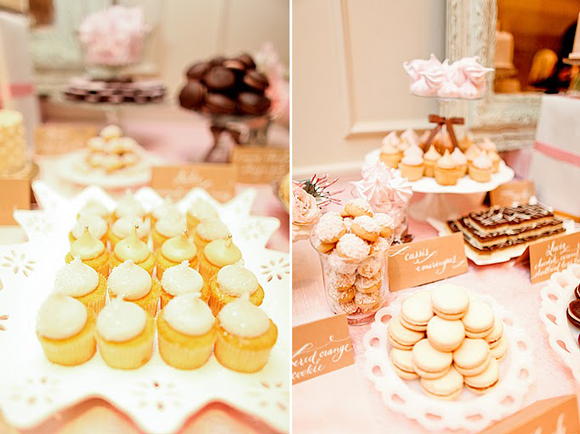 This wedding is overflowing with preppy sophistication and we can’t get enough of it! Katie and Jack were married at the Convent of The Sacred Heart on Manhattan’s Upper East Side. After the ceremony, the couple rode to their reception in style in an iconic vintage taxi, while the guests and bridal party headed to the reception on chartered Greyline double-decker buses – complete with champagne and a tour of the city! 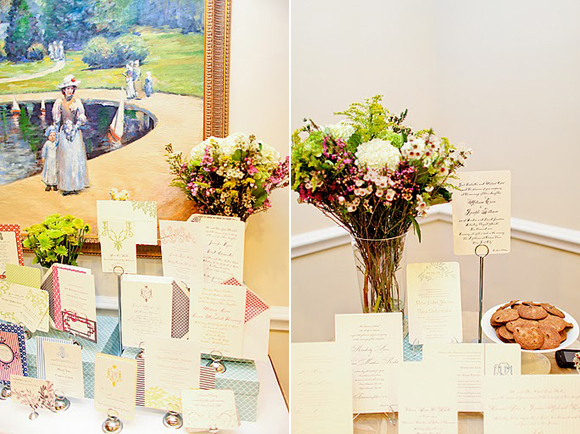 Congratulations to Katie & Jack, and thanks again to Lily for sharing these beautiful photos! Be sure to visit her blog to see more photos from their big day: part 1 | part 2. While in New York City last week for our Kate’s Paperie events, we took the time to visit many of our favorite Smock retailers! We have lots of photos of our events with Kate’s to share, but first we wanted to share a little glimpse at the rest of our travels across Manhattan and Brooklyn. Our first stop was The Village Invites on 43rd where we spent time chatting with Linda, Adrienne and Jaye. 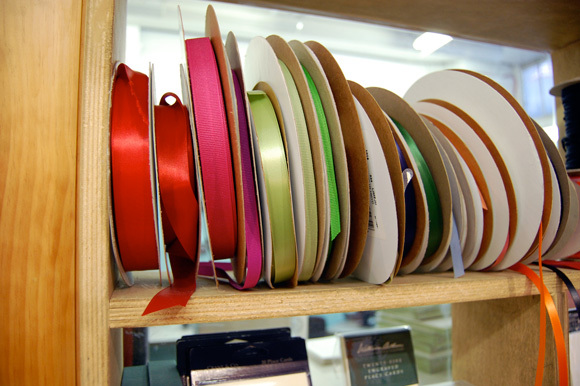 They have the prettiest assortment of great gift wrap and big spools of ribbon that make us dream of wrapping the loveliest of holiday packages. Being Halloween week, there was no shortage of costumes to be found throughout the city. 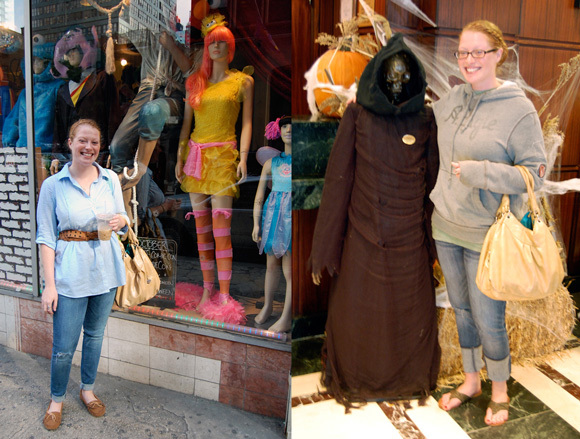 Here, Lindsy poses with a great Big Bird costume and with a creepy skeleton in our hotel lobby. 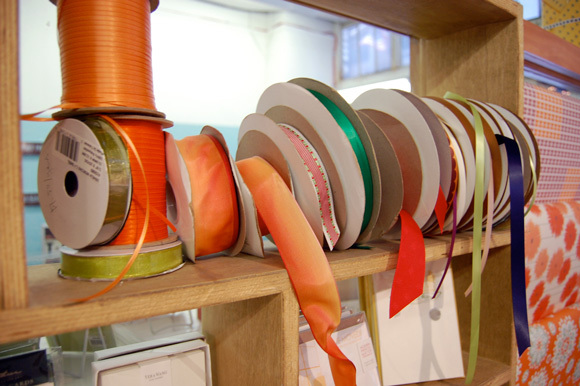 Debbie’s studio space is filled with gorgeous letterpress creations and is a haven for stationery lovers. 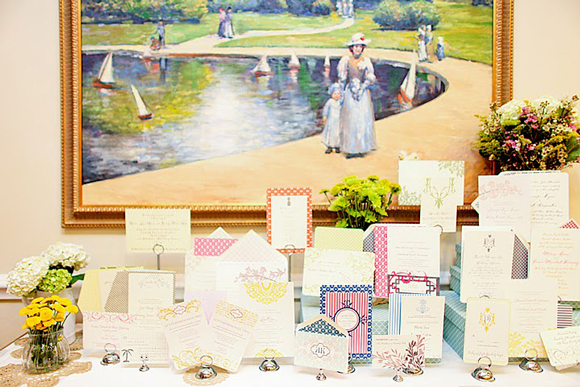 She works attentively with each client to dream up the invitations, card and announcements of their dreams, filled with unique details and personal touches. 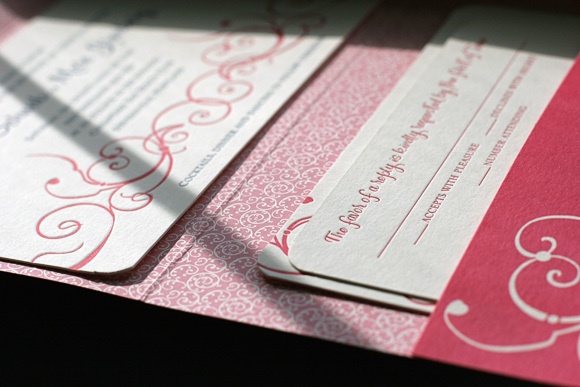 We love this recent customization of our Cindrel letterpress wedding invitation design that she created with a client for their upcoming June wedding. 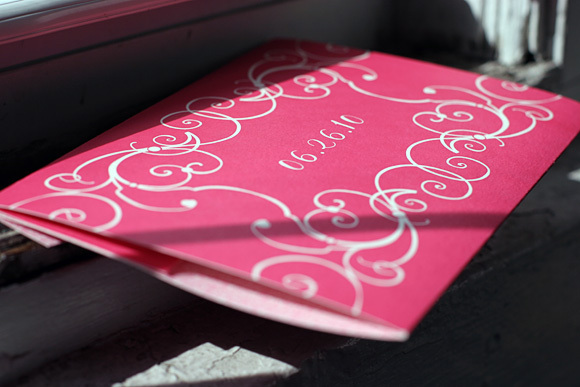 It features a custom folio printed in azalea ink that showcases a unique customization of the Cindrel motif creating a frame around the couple’s wedding date. The interior of the folio is printed in our pippin pattern in blush ink and features several inserts detailing event information, lists of local accommodations and more. The letterpress invitation itself is a horizontal version of our Cindrel design printed in azalea ink paired with navy to match the other event details the couple is planning for their wedding. If you were invited to the White House for dinner, what would you wear? I would want to wear something elegant and special. 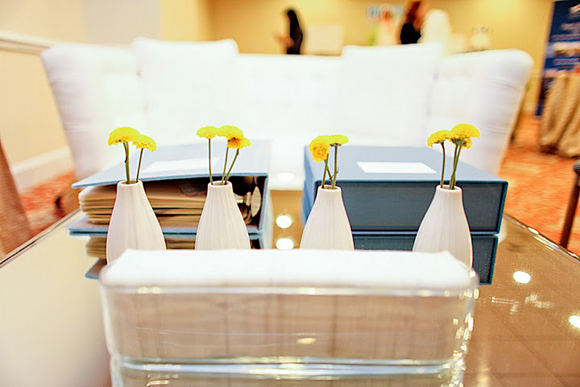 As with any invitation, it is important to have a memorable and unique presentation that reflects the event. 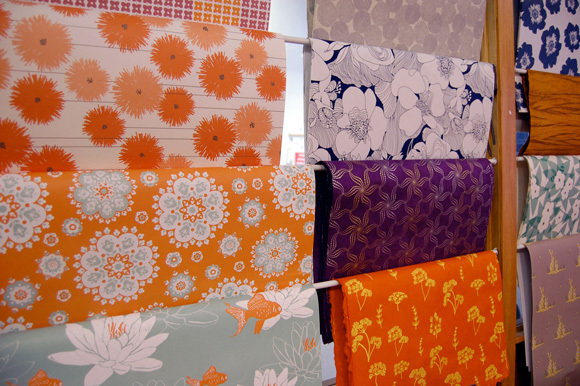 If you could describe your personality in letterpress, which Smock design would you be and why? 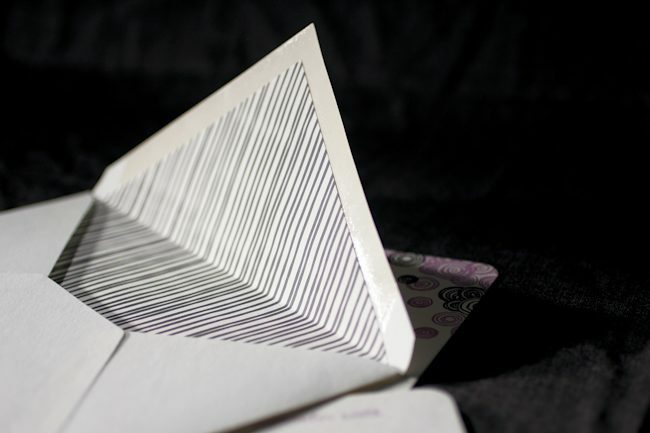 It would be Vettore, which I used when I did my letterpress holiday cards through Smock. I used Spence and Engravers printed in red ink. What would you suggest as must-visit places for first time visitors to New York? 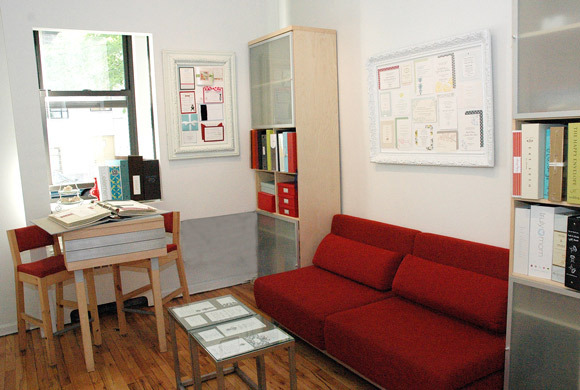 My studio is right across the street from the Guggenheim Museum and Central Park, both must sees on your visit. It is also right off Madison Avenue, an area boasting some of the most renowned stores in the world. 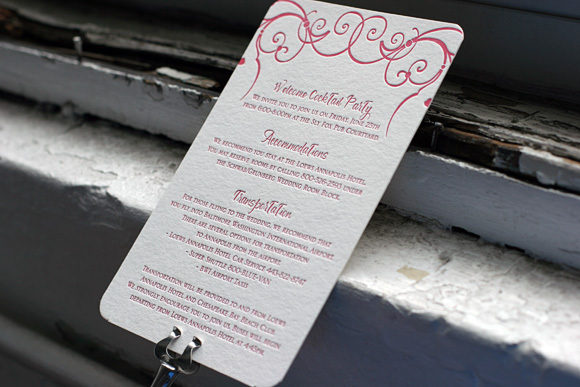 I love helping people find the right invitation and making the experience fun instead of stressful. My store has a warm, unique and cozy atmosphere that makes people feel comfortable and excited to take part in planning their event. 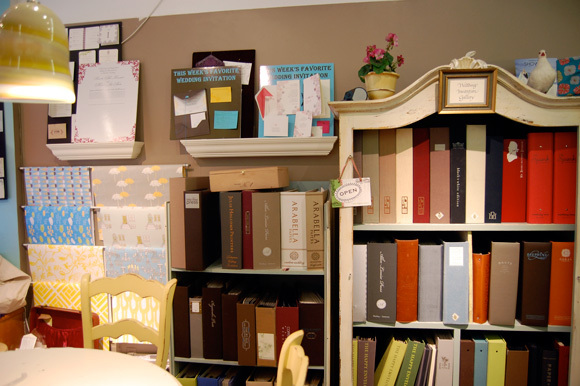 I love stationery and enjoy looking through my books with my customers. 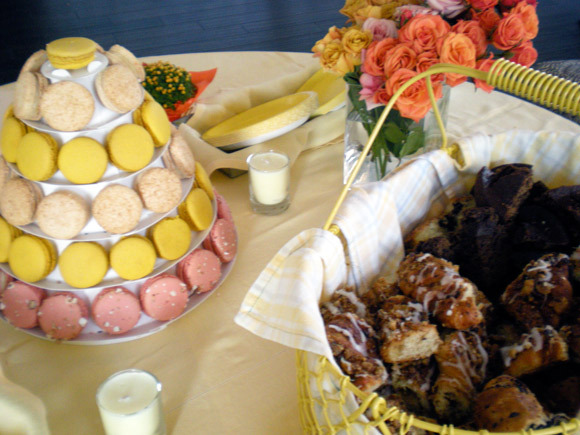 Earlier in the week we shared a little sneak peek of our Smock display at The Wedding Party this past weekend. 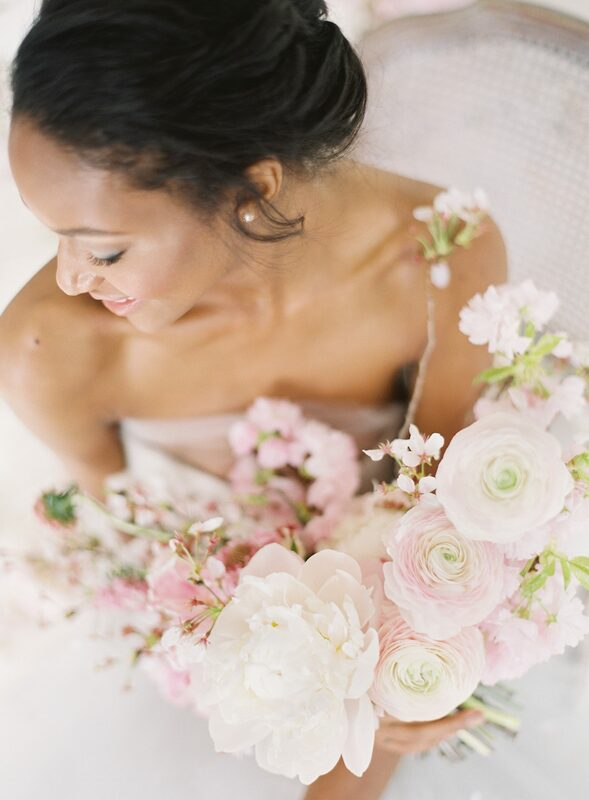 Today we are back with more gorgeous photos from the lovely Jen Huang so you can see even more of the inspired vendors who were a part of this magnificent bridal event. 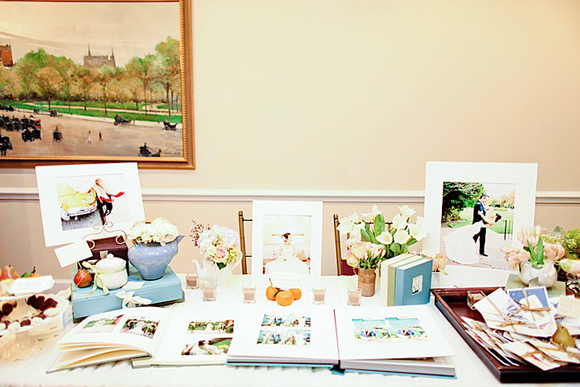 First up is Jen herself and the beautiful display of her photography and wedding albums she brought with her to the show. 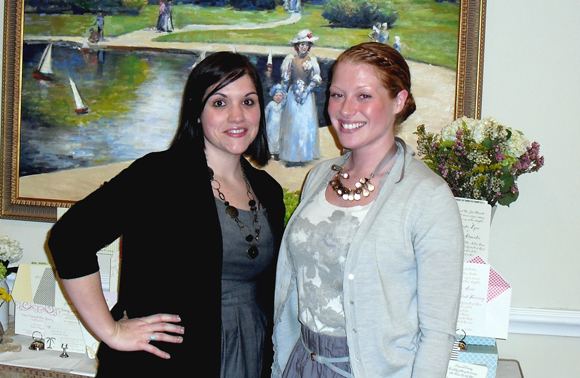 Jen’s work is modern yet timeless and her personality is so sweet and charming – we loved spending the day with her! 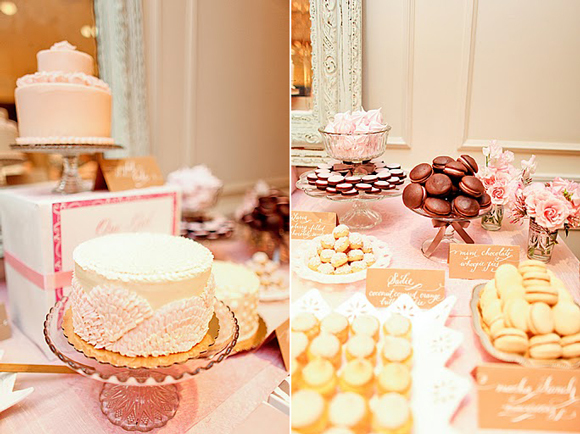 In addition to pretty cakes and cupcakes, there were also gorgeous flowers in soft shades of pastel and blush pink. 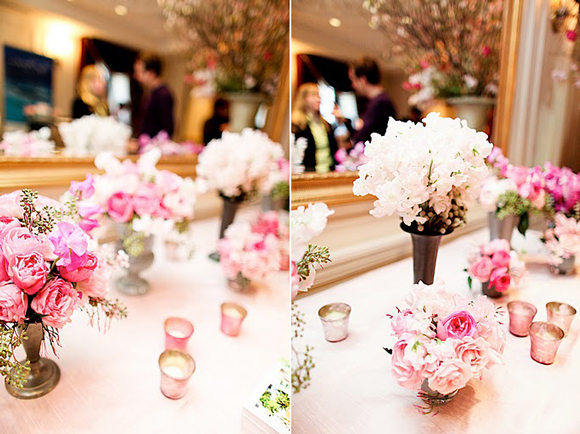 Fluffy rose centerpieces and rose scented-candles were scattered throughout the space creating a lovely sensory experience visitors won’t soon forget. And there were even more cakes and sweet treats. 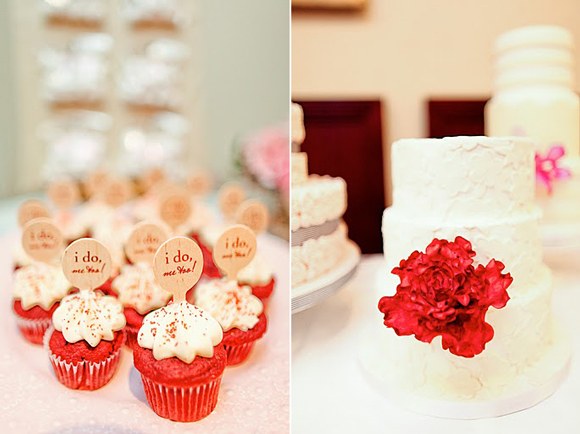 These red velvet cupcakes feature cute little cupcake sticks from For Your Party – colors and designs can be customized for any event. 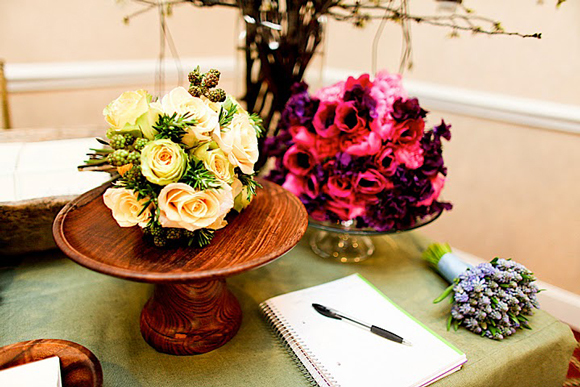 We loved the vibrant bouquets and floral arrangements from Stone Kelly Events & Florals. The rich jewel tones were in contrast to the a lot of the other pastel flower creations throughout the show and the punch of color was really beautiful. 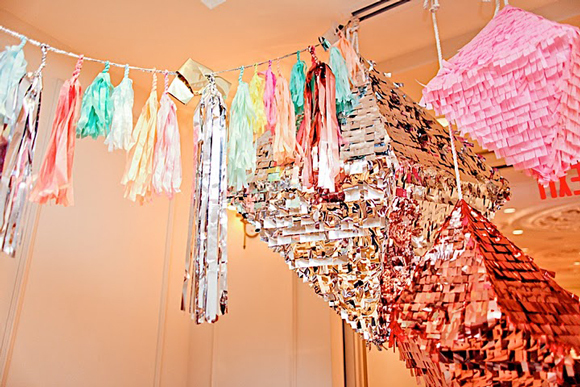 Another favorite were the party decorations on display from Confetti System. 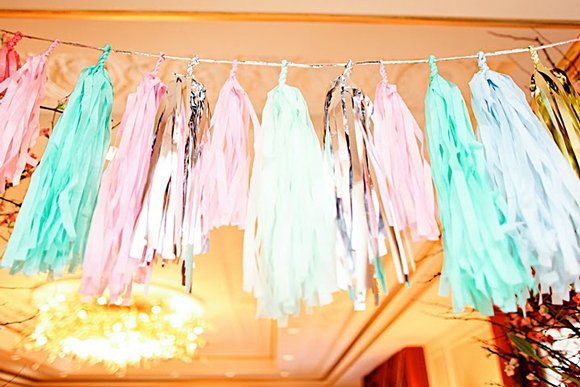 The shimmery pastel metallic colors were so festive and a really fresh look. We’re looking out for this look to be a new trend in weddings for 2010! Of course, no recap is complete without an obligatory photo of the Smock team. 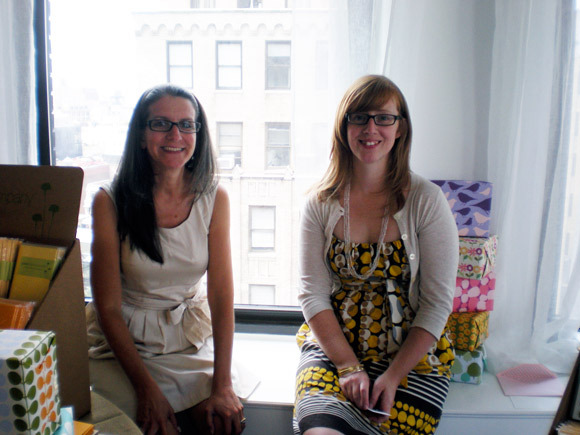 Here is Lindsy and I as we finish up prepping our space for the event and look forward to meeting lots of enthusiastic brides. Thanks to our new friends at Sperry Tents for snapping this quick photo for us! A big thank you to The Wedding Library and the awesome staff at the New York Palace for your warm hospitality and for pulling together such an amazing event. We loved being a part of it! Over the weekend, Smock participated in The Wedding Party hosted by amazing team from The Wedding Library at the New York Palace Hotel. It was incredibly fun to be a part of this beautiful bridal show event and to get to meet so many brides just embarking on their wedding planning adventures. The day was officially kicked off with Darcy Miller of Martha Stewart Weddings speaking to brides about current wedding trends, including a few highlights of her own wedding, followed by event planner extraordinaire Colin Cowie. 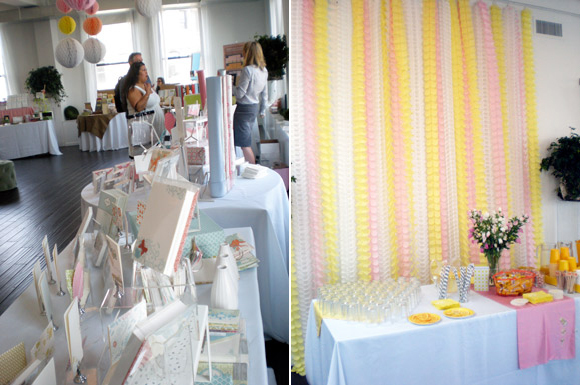 Later in the day, brides were invited to visit the incredible showing of talented wedding vendors (including Smock!) and to watch a breathtaking Vera Wang fashion show. We have so many photos from the event to share later in the week, but first up we wanted to give you a little sneak peek of our Smock display. 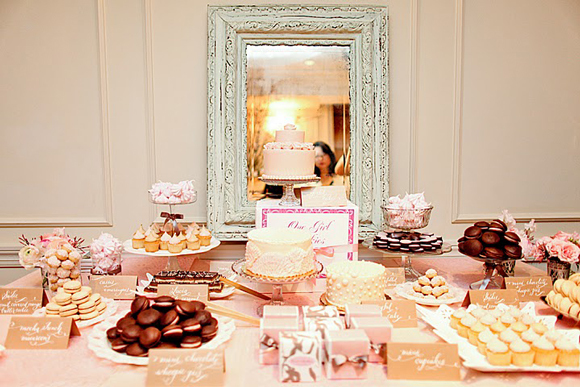 We rented furniture from Taylor Creative Inc. so we could invite brides (and even a few grooms) to sit down and flip through our albums while snacking on tasty Tate’s chocolate chip cookies. 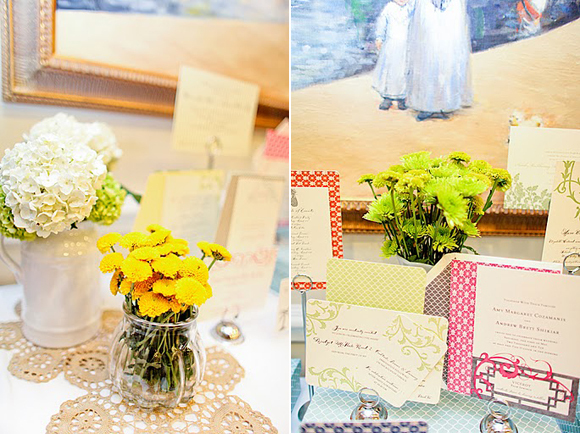 We brought a collection of pretty milk glass vases and containers, stacks of our signature Smock boxes and simple accessories like vintage doilies and then pulled together a long table displaying just a small handful of some of the most beautiful Smock customizations we’ve had the pleasure of printing in recent months. On our way to the Palace on Saturday morning, we stopped off at a cornerstore on 50th and grabbed huge handfuls of flowers that we arranged in assorted sizes and shapes of containers to add a little extra pretty to our space – it smelled so amazing! 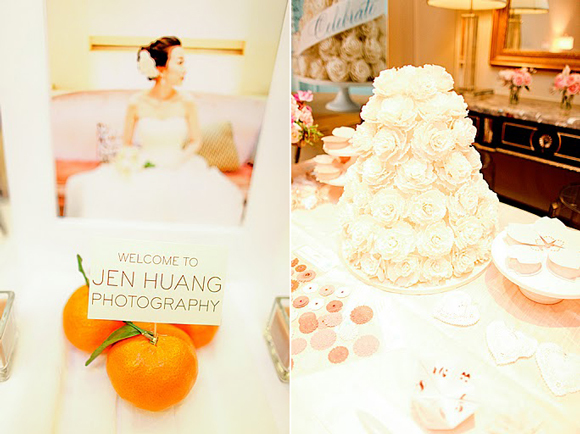 Lukcily, we shared a room with the wonderfully talented Jen Huang who took these photos for us to share with you. We have a lot more photos to share later in the week – stay tuned! 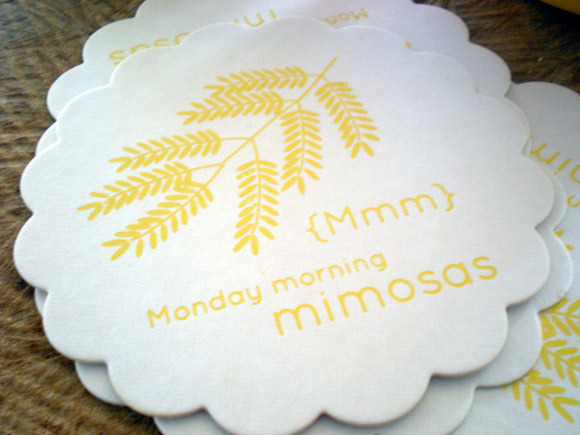 Have we mentioned already how much fun was had at Monday Morning Mimosas? Not only did we get to hang out with good friends, but we also got to spend the day in the incredible loft space of Hatch Creative Studio, with amazing event details pulled together by Erika of Delphine. Pretty paper streamers, and fun MMM-themed coasters and cocktail napkins, even color-coordinated Paulette macarons kept all of our visitors (and us!) oohing and aahing as they walked in all day. 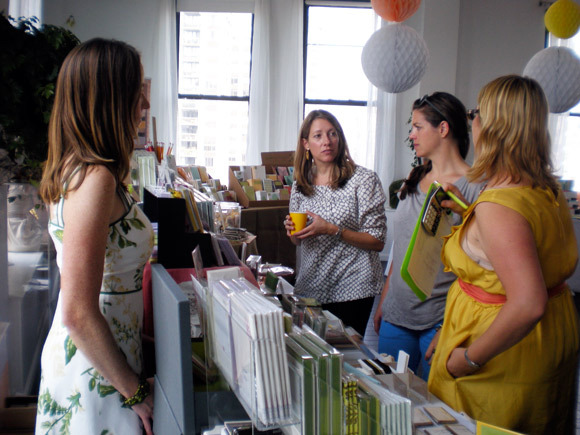 Bobbi and Erika of Delphine chatting with friends Jennifer from Orange and Pear and Chloe from Toots & Magoo. 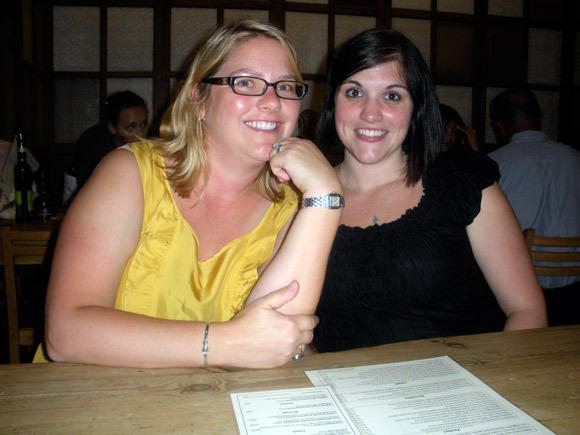 Erika of Delphine [left] and me, hanging out at lunch after Monday Morning Mimosas. 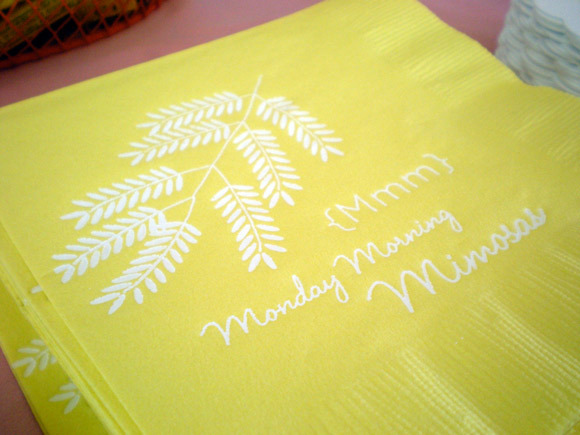 Stay tuned for more from Monday Morning Mimosas! Thank you to everyone who came out for Monday Morning Mimosas this week and to all of the excited Smock fans who showed up for our sample sale that evening! It was wonderful to meet so many new people who share our love for great letterpress, stationery, lovely candles and chic office supplies. 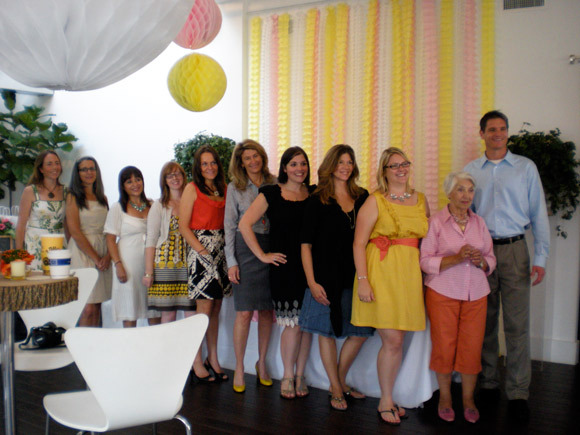 We had a fabulous time with our friends from Delphine, Linnea’s Lights, russell+hazel and Green Paper Company. For those who couldn’t make it, here’s a sneak peek at the event….there are many more photos to come!